The perfect blend of fine wines and superb food in the historic setting of a country manor is on offer when Grand Mercure Mount Lofty House hosts 'Tasting at the Top' on 17 June. The evening will feature a six-course degustation menu created by Piccadilly Restaurant's Executive Chef, Girard Ramsay, utilising the restaurant's own organic kitchen garden and fresh local Adelaide Hills produce. Award winning Tomich Wines, carefully matched and presented by winemaker and host for the evening, Randal Tomich will ensure a feast of the senses encompassing food, wine and spectacular views. Piccadilly Restaurant offers a very Adelaide Hills experience perched atop Mount Lofty offering spectacular views of surrounding vineyards, gardens and woodlands. Executive Chef Girard Ramsay has created an exceptional a la carte menu that has truly captured the taste of the Adelaide Hills, offering one of the finest dining experiences in South Australia. After dinner, settle into the leather chesterfields by the fire for a glass of port and soak up the tranquil atmosphere. A gracious boutique property, Mount Lofty House boasts a long and interesting history since it was built in the 1850s as a summer house for politician, lawyer, pastoralist and businessman Arthur Hardy and his family. Hardy also had the foresight to plant the highest vineyard in South Australia on the Mount Lofty grounds in 1857. The vines have been lovingly restored to produce their first vintage of Chardonnay in 2007. 'Tasting at the Top' brings together the best of the Adelaide Hills, combining superb food and wine with country hospitality and service - all just 20 minutes from Adelaide CBD. With winter biting at the ankles of wine-loving Australians, it makes sense that the refrigerated section of the local bottle shop is quickly becoming lonely and abandoned, and the area dedicated to heart-and-soul warming red wines is understandably populated. Andrew Koerner, Senior Winemaker at Blue Pyrenees Estate is thrilled for these two versatile releases to be hitting the stores, and feels that whatever the occasion – there is a Blue Pyrenees Shiraz to suit. The Blue Pyrenees Shiraz 2008 (RRP $20) is a true expression of it's region, and although the 2008 vintage was a giant heat-wave for much of Australia, the grapes for this wine were picked at the optimal time making this medium bodied wine fresh and vibrant. "Fortunately, we were able to pick all our Shiraz grapes prior to the heat-wave" Koerner says of the scorching 2008 vintage. "All of the Blue Pyrenees Shiraz is produced from parcels of fruit grown on low-yielding vines and the warm dry weather we experienced leading up to harvest were ideal ripening conditions for these exposed grapes." Whilst both wines are drinking beautifully now, The Blue Pyrenees Shiraz 2008 is one for all occasions where the Blue Pyrenees Reserve Shiraz 2006 will benefit from some careful cellaring and taken out and savored with some special friends. The Blue Pyrenees Reserve Shiraz 2006 (RRP $35) came from a vintage ideal for producing full-bodied red wines with the traditional warm autumn conditions. Inspired by wines of Northern Rhone, this bright ruby red Shiraz has a touch of Viognier (2%) which was co-fermented with the Shiraz, plus three extra weeks of maceration to ensure maximum tannin extraction, firm structure and youthful hue. "I am always impressed how these old estate vines can produce such wonderful variation in this versatile variety, while maintaining a wine style truly reflective of its terroir and vintage conditions" says Koerner of his much loved Shiraz wines. Blue Pyrenees Shiraz 2008 RRP $20 is distributed nationally by Red+White and available in all leading wine retailers. NOTE TO READERS - Join the Blue Pyrenees Single Vineyard Wine Club for 20% off these wines plus the rest of the wide range of Blue Pyrenees wines. EVANS & Tate's Redbrook label wines are made only when vintages are at their best, and their 2008 Margaret River Cabernet Sauvignon is a wine from one of those best-vintages – as winemaker, Matt Byrne says "one that was a once in a decade." Good winter rainfalls were followed by consistently even temperatures that resulted in a wine that's medium-bodied with exceptional aromatics and great length of flavour, and the wine also reflects the vines from which the fruit was sourced: they're some of the oldest in the region. "Each year we are seeing the beauty of what age imparts to the vines and the resulting flavours," Matt says. "2008 gave a lovely intensity to the fruit, while still showing refinement and balance… it was classic Margaret River worthy of bottling under the Redbrook label." Redcurrant and tobacco leaf are to the fore with this one, together with more subtle characters of cassis, green olives and blood plums, all rounded out with nice savoury spice from maturation in French oak. At $39.99 enjoy with roast lamb and fresh mint sauce. TRY this with veal scallopini and a squeeze of fresh lemon. ONE FOR LUNCH: ALTHOUGH a relatively new viticultural region, only being planted to vines in the early 1990s, Tumbarumba in NSW's Snowy Mountains already has a reputation for some outstanding cool-climate Chardonnays. 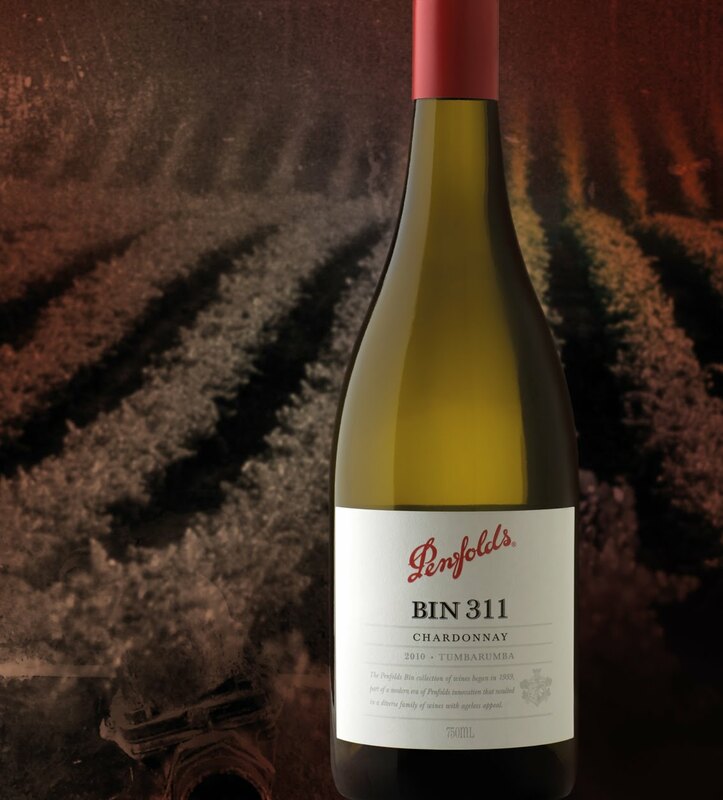 One in particular is Penfolds' 2010 Bin 311 Tumbarumba Chardonnay that in fact is a spin-off of the iconic Bin 144 Yattarna Chardonnay that's made from fruit from the same region – and chosen for its superb aromatics, creamy flavours, fruit complexity and minerality. The 2010 Bin 311 is beautifully lemon sorbet on the palate with coupling slate minerality; a great match with veal scallopini and fresh lemon at $39.99. Can't make it to the Hunter Valley this winter for Hunter Valley Wine & Food Month in June? Well, Tintilla Estate is coming to Sydney for their annual Winter Solstice Dinner - one of the best Hunter wine & food experiences outside of the Hunter! In the grand winter tradition, join one of the Hunter Valley's most exciting family-owned wineries for a superb 6 course degustation dinner and discovery of the new vintage releases of their heart-and-soul warming red & white wines, including Tintilla's highly regarded Shiraz and Sangiovese wines. Proceeds from the evening go to Concord Hospital. Tintilla pioneered the planting of sangiovese in the Hunter and their mature vines now make some delicious straight varietal wines. They also blend it with shiraz or merlot to create wines with an extra degree of finesse & familiarity. Come and try their styles and then make your own blend with other varieties to see if you can design the next big blend! A prize of Tintilla wines for the most popular blend. Join the Lusby family at Tintilla in front of their cellar door fire to discover the luscious world of fortified wines – the ultimate indulgence. Tintilla have a vast array of these delicious "soul-warmers", including Liqueur wines made from semillon, chardonnay, cabernet and shiraz, and examples of both Vintage and Barrel aged styles. Learn all about the different winemaking techniques and as a special treat, be the first to try the long-awaited, newly-released Tintilla Old Parish 15 year barrel aged liqueur shiraz. Samples of the wines will be enhanced by specially matched canapés, the perfect indulgent warm-up before dinner at one of the Hunter's great restaurants. BACK in the early 1970s Leasingham in the Clare Valley produced a Cabernet Malbec blend under a Bin 65 label, a wine that was recognised at the time as one of Australia's greatest reds. It was the creation of the late and extraordinarily creative "Mr Mick" Knappstein, one of whose protégés was a young and upcoming winemaker named Tim Adams. Today Tim and his wife Pam Goldsack have their own winery in the Clare, and Tim's 2006 Cabernet Malbec shows just how much he took on board under the guidance of "Mr Mick." Tim's first Cabernet Malbec blend was from the 2003 vintage and had just 10 per cent Malbec; he increased this to 11 per cent with the 2004 vintage, 14 per cent in 2004, and its now 20 per cent in the 2006. That 20 per cent has given this wine wonderful complexity on the palate as Malbec does very well in the Clare, and is a natural foil for the Valley's exceptional Cabernet Sauvignons. This one is loaded with fresh blackcurrant, violet and oak flavours; at $30 enjoy with an oxtail beef ragu and gnocchi. to enjoy with brunch omelettes. ONE FOR LUNCH: CAVA is the name the Spanish give to their sparkling wines, and Easter is a time of year when much Cava is drunk during the Spanish Semana Santa – or Holy Week. Segura Viudas is one of Spain's major producers of Cava, with a well-deserved popularity in its home country and internationally; in Australia around 1,500 cases are sold annually, with sales increasing year after year. 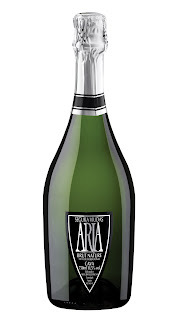 It's latest Aria Brut Nature is a lively bubbly with fresh pineapple, almond, honey and straw flavours, and hints of pears and fresh bread. At just $20 it's an excellent drop with omelettes at brunch – or any other time for that matter. If you're being dragged into winter kicking and screaming in fear of hibernation and nothing to do, this upcoming event in the Hunter Valley will warm your heart with excitement. The fifth annual Hunter Valley Wine and Food Month this June is promising an even bigger and better line up of over 70 events ranging from small intimate experiential affairs to large celebrity laden festivals, letting you get a taste of simple sophistication! A Tourism NSW Regional Flagship event, the Hunter Valley Wine Industry Association will proudly present a series of themed activities that includes mouth watering dinners with leading Hunter Valley winemakers and chefs, an array of fun and interactive classes to fine tune those culinary skills, a showcase of local premium wines and fresh produce matched to perfection, and delectable tasting experiences by a roaring fireplace. This year, the festival has introduced self guided tours unveiling the excellence of Hunter Valley Trophy, Gold winning and Heritage Vineyard wines. And if that's not enough... roll out the barrel...as you'll get an exclusive chance to blend the 2011 reds with the wine masters themselves. Hunter Valley winter lifestyle would not be the same without a weekend cheering on the Pokolbin Reds, join the locals and cheer on our winemakers in the local Rugby Union competition. All these activities provide a chance for visitors to meet and become a part of the local community and share their Hunter Valley wine and food culture along with all the other wonderful things the region has to offer. Get in quick and make this June one to remember! Winter... what winter? · FlavourFest at Hunter Valley Gardens, a 3 day festival featuring Masterchef stars Callum Hann and Alvin Quah. · Australian Regional Food Store and Cafe will offer a native flavours luncheon that will make you feel patriotic! · McWilliam's Mount Pleasant Elizabeth Cafe White Wine and Red Wine Tasting Plates. 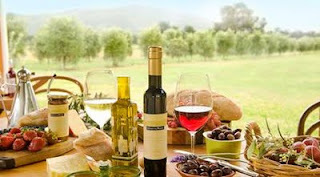 · Whispering Brook Olive Grove Long Lunch – delve into the world of olive oil over a long leisurely lunch. · Scarborough Wine Co regional tasting plates. · Moorebank Wines picnic cheese and condiment platters and Divine Grape Vine Produce Tasting. In the Hunter Valley we love long leisurely lunches and dinners centred around shared dishes, a range of great wines and of course good company. As part of this series we have introduced 'Restaurant Week', from Friday 17th June to Sunday 26th June, when several restaurants will feature a series of set priced grazing menus paired with wines so you too can sample this relaxed way to spend a wintery day. For those who want to explore their 'inner foodie. Learn how cheese is made, what to look for in a quality olive oil, and most importantly how to really impress your friends in the kitchen! · McWilliams Mt Pleasant match makes at "The Wine and Cheese Marriage: tips for avoiding a nasty divorce". · Hunter Valley Cheese Shop hosts cheese appreciation and wine matching classes perfect for 'the connoisseur'. · Margan Restaurant shows you how to select from your own garden and then cook with those fresh delights. · Join a Goldfish Hunter Valley Cocktail School and make wine based cocktails. · Learn the art of combining flavours at Tempus Two & Smelly Cheese Shop's premium wine & world of cheese workshop. This series of lunches and dinners is hosted by leading winemakers in their wineries or their favourite restaurants. It's a great chance for them to raid their cellars, launch their latest vintages and create an amazing line up showcasing the wines of the region. Working closely with Hunter Valley Chefs, they create menus that pair perfectly with their wines to ensure a memorable food and wine experience; its a favourite event on their calendars as they share their love of Hunter Valley wines.. Bookings are essential. · McGuigan's Wine Dinner – held amongst the barrels in the winery with menu prepared by highly awarded Chef Jean-Marc Pollet paired to McGuigan's wines and hosted by Neil McGuigan and his team. · Tower Estate Wines at Robert's Restaurant with Winemaker Samantha Connew. · Winemaker Scott McWilliam of McWilliams Mount Pleasant at Redsalt Restaurant Crowne Plaza. For the aspiring 'wine master'... Hosted by Hunter Valley winemakers and wine educators in small groups, guests will have the opportunity to understand Hunter Valley wine in depth and ask those questions they have always wanted to from the winemakers they admire! · Self guided Hunter Valley Trophy, Gold and Heritage Vineyard wine tours will dazzle your pallet. · Barrel & Blending Weekend will make you feel like a winemaker yourself as you assist the winemakers in the winery. 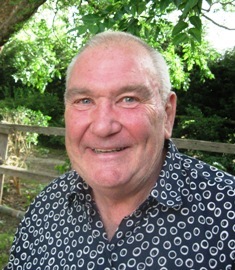 · David Hook Wines Tutorials will assist you to understand different wine varieties and the advantages of aging a wine. A series of indulgent experiences set by the open fire at guest houses, cellar doors and restaurants; the perfect way to indulge on a winter's day; a perfect way to relax, slow down and feel the gentle pace of country living. Afternoon tea by the fire, cheese and fortified wine, or canapés before dinner, are just some of the delights that await. Delicious warming Soup, crusty bread, cheeses & wines to match by the fireside at Mistletoe Wines. High Tea fireside at Tower Lodge. If you want to be with us to launch the month join us at Goldfish Hunter Valley, our newest and favourite cocktail bar, on Friday 3rd June for an evening of wine, canapés and entertainment. For those wanting to take a mini break, there are some fabulous accommodation offerings. From rustic cottages, to luxurious award winning resorts such as the Crowne Plaza Hunter Valley, the region offers romantic getaways for two or a chance to holiday with family or friends. With so many great wine and food activities on throughout June, these options will be popular and we recommend you book your accommodation now. Tickets are on sale now for one of the best events during this year's Hunter Valley Wine & Food Month (June 2011), the annual Whispering Brook Olive Long Table Luncheon. Last year's inaugural, sell-out event has been topped this year with even more food, wine and olive discovery planned during the course of the day. At the heart of the event is a spectacular 4 course meal, designed by Chef Carolyn Scott to uniquely highlight the quality and flexibility of the Australian olive (as well as perfectly complement the wines from Whispering Brook). The luncheon will be fittingly set amidst the picturesque olive groves at Whispering Brook and this year's menu includes a Redgate Farm slow cooked duck leg in merlot, green olives and dried Kulnura figs and an Italian chocolate & raspberry olive oil cake with local Udder Farm pure cream! The lunch will start with a tutored walking tour of the estate's olive groves and vineyards so you can learn about the different varieties of olives. And after Carolyn has taken you through the menu and unravelled the secrets of matching food with different styles of olive oil, leading Australian olive expert Peter Olson will be on hand to expand your olive appreciation with a background into the production of olive oils and the art of olive tasting. Peter is an olive oil judge at the Royal Sydney Fine Food Show and former head of NSW Industry & Investments Olive Oil Testing Service, so who better to disclose the true delights of our own "liquid gold". LAPSED devotees of Chardonnay looking for an enticement back to the fold, should look to Katnook's just-released 2009 Founder's Block as good reason to once more take up a glass of what was once Australia's favourite varietal. Because this is a Coonawarra wine that tells us what good Chardonnay is all about: abundant ripe peach and melon flavours with a nice hint of grapefruit to it, and a texture in the mouth that's delightfully smooth and silky. Fruit for this came from an interesting vintage, one that was preceded by four days of record high temperatures, followed by a welcome spell of mild temperatures and rewarding dry conditions. The latter contributed to a long and slow ripening period that allowed the fruit time to develop wonderfully rich varietal character, and while it's ready to enjoy now with roast pork or pan-friend Atlantic salmon, it will reward those with space in the cellar for a case to enjoy through 2013-2014 as it develops further rich flavour complexity. At $18 a bottle it's a worthwhile investment. ONE FOR LUNCH: BLUE Pyrenees' Senior Winemaker, Andrew Koerner is an unabashed lover of Shiraz, and for his 2006 Reserve Shiraz looked to the wines of France's Northern Rhone for inspiration, adding a touch of Viognier to give that "little extra" to this special wine. Although that Viognier component was just two percent, when coupled with the Shiraz off 40-year old vines, it's resulted in a wine with exotic white and dark fruit flavours, fine tannins and a typical Shiraz peppery finish. Pay $33 and pair it with a cooler-weather oxtail stew, or herb-grilled tuna steaks. 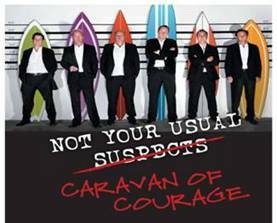 The surf boards are on the roof racks and the wineglasses are polished and packed safely in the boot – in just one month from now the New Generation Hunter Valley winemakers will embark on "Not Your Usual Caravan of Courage" and are excited to announce where you will be able to catch them between Melbourne and Noosa. This is 'Not Your Usual' itinerary, and it is jam-packed full of wonderful wine tastings, fantastic food pairings, pop-up wine tastings, a stop for a surf along the way and of course some delicious degustation dinners! Day 9: Friday May 13 | Noosa – come down to the Noosa Food and Wine Festival which starts today and goes through until Sunday 15th where the New Generation Hunter Valley boys have their wines on tasting and are featured on panels in the international line up of celebrity chefs and winemakers. Tickets to all pop-up tasting events are $25 per person and start at 5:30pm local time (unless stated otherwise). Tickets will be available to purchase online at www.newgenerationhuntervalley.com.au from 9am on Wednesday 13th April. ANDREW Margan won't be the least offended if you don't even think of the word 'cellar' when buying a bottle of his 2010 Margan Hunter Valley Verdelho. Because this is a more-ish wine that once you've enjoyed the first bottle you'll be looking for quick reason to go out and buy one or three more – Andrew didn't make this one to buy and put away, he made it to buy and enjoy now. Coming off the Margan Cornerstone Vineyard whose low-bearing vines are rich with history as some of the oldest Verdelho in Australia, the resultant 2010 wine has lively citrus fruit flavours coupled with ripe tropical fruit overtones to give beautiful richness on the palate. And although 2010 was one of the more difficult vintages in the Hunter, Andrew Margan has created a great wine by picking in two batches: the first being slightly less ripe with that citrus and some green apple characters, the second coming later with the riper tropical fruit input. Pay $18 and enjoy with your favourite pastas and creamy sauces. ONE FOR LUNCH: Owners and winemakers at Bendigo's Blackjack Vineyards, Ian McKenzie and Ken Pollock sum up the 2008 vintage in one line: "Our vintage from hell and the most difficult in our 20-plus years history." The problem for them and others in southern Australia was an exceptionally hot beginning to the year, forcing them to pick fruit for 13-days straight rather than their more leisurely spread of five or six or more weekends. And they had to beg or borrow as many unused fermenters they could find to boost their own as fruit sugar levels went almost ballistic, or fruit threatened to shrivel and die. But they came out of it with a very grand Blackjack Major's Line 2009 Shiraz that's all about red berries, creamy oak, balanced acid and fine tannins. Grab a bottle at $25 and enjoy with lamb shanks and a parsnip mash.